Our fire fighter friends have officially adopted Snowplow as their ambassador in partnership with their Dalmatian which is Snowplows friend. They like his truck more than theirs because of the love it contains. The children love our bundle of love and he’s all hugs and kisses with all his friends in the neighborhood. On Halloween he likes to be the center of attention and greeted the children with the Fire Truck which is equipped with siren and sounds. And most important was the recognition for the true heroes that serve our community in this profession. 1-The fire engine was designed and developed from a large box. The box was placed on our Snowplow to ensure we had measured the length and width correctly. We marked each end to open so Snowplow could be the fire chief inside the fire truck by an opening in the front and back of the box. We wanted to ensure Snowplow could walk comfortably in the costume. 1-The fire engine is made from a large cardboard box and wrapped in red duct tape. 2- The Black Fire Chief Hat and fireman boots were purchased. 3- The hose is a washing machine hose. 4- The plastic sledge hammer is used when camping and hammering the tent stakes. 5- The lettering was done on the computer with a stencil font on bright yellow paper and each letter was individually cut. Using a glue stick the letters identifying the fire house and district were placed on the sides of Snowplow’s fire truck. 6- The windshield is made from white card stock paper outlined with black and silver duct tape. The windshield and windows were shaded with a diagonal blue wash.
7-The sirens are upside down disposable cups that have been painted with Mod Podge and covered in silver and blue glitter. Firefighters are important role models for kids because of their bravery and dedication. 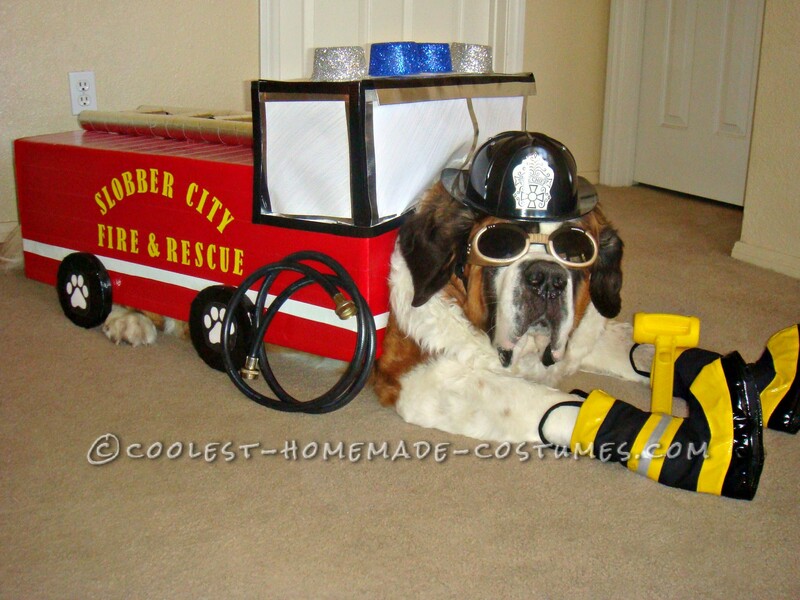 We wanted to support the idea with a fire truck and fire chief as a costume for our family dog Snowplow to surround the neighborhood kids with. Since the most recognizable firefighter item is the fire truck we began with the cardboard box design. You can build an inexpensive toy fire truck out of a leftover cardboard box. Depending on the size of the box, the family dog and kids can get in it and pretend to drive or use it as a decorative toy box after Halloween. The design and development of our fire truck with Snowplow as the fire chief proved to require several cookie treats for our fire chief during the costume fittings and alterations. Snowplow likes to be the center of attention and involved in everything as our family dog so he sat on the floor with us as we created his costume. Occasionally we would have to stop and give him hugs to let him know he was helping. It was developed from a large cardboard box as an eco-friendly design in recycling a box. The idea was in honor of our fire fighter heroes and the hotshots fighting the wild fires close to our home in Nevada and Northern California. We live close to a fire station and Snowplow, our 170 lb St. Bernard loves the firemen and women as we walk by each day. They love to greet him as he wags his tail and visits with his kisses. Snowplow as the fire chief in his red fire truck costume was created with the neighborhood children’s love as well in tribute to these men and women who protect us in their selfless efforts in behalf of our community. From the neighborhood fire house to the hotshots fighting the wildfires the children look to these community leaders with recognition and respect. The police and firefighters always love to see Snowplow in community events especially in his doggles and brandy keg. The reaction to Snowplow in his Fire Chief costume and Fire Pawtrol was with love, to the firemen and women as a fitting tribute in their finest hour. And in honor of the care they display in everything they do to support the community with their loyalty each and every day.